The OB team has been living in a bit of a time warp over the past few months as we mined the magazine archive for tidbits to use in our 100 Best Companies to Work for in Oregon 25th anniversary package. Publisher Andrew Insinga dusted off decades-old issues archived in the basement. Research director Kim Moore pored over articles, lists and data; she also interviewed 100 Best winners, former OB editors and leaders from other organizations that helped kickstart the 100 Best Companies to Work For project a quarter century ago. The research and interviews yielded a (soon to be revealed) vivid cover design, produced by art director Joan McGuire, as well as a feature package highlighting stories and memories from OB staff and 100 Best participants. We think you will enjoy reading about the history of our flagship workplace satisfaction project. And the behind-the-scenes anecdotes from former staffers — companies prying open locked cases of magazines to find out their rankings — should elicit a chuckle or two. Kim also authored an article in this issue examining the pros and cons of workplace surveys. By now a common tool to gauge employee satisfaction, the workplace survey is no easy document to produce nor to administer, and those of us in the business must remain ever on the alert to companies that might game the system. Ensuring the questions remain relevant to today’s diverse workforce is another challenge. This issue also features an article about new tech and federal contracting programs that are opening up jobs and economic development opportunities for Oregon tribes — in Denver, California and beyond. Speaking of making history and staying current — Knute Buehler, a surgeon and Oregon state representative, aims to become the first Republican to win the Oregon governor’s race in several decades. Reporter Tim Neville spent a few days with Buehler at home and on the campaign trail. His profile is a great character study; the article also paints a picture of the factions that are splintering both political parties, and raises questions about the ability of any candidate to unify the electorate around the big challenges facing the state. But enough about politics. March is a time to party (end of winter, anyone?). Congratulations to all the companies who made the 2018 100 Best list. 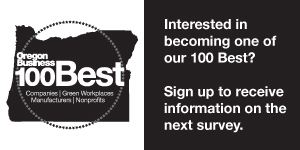 And if you didn’t enter this year, don’t forget to register for the 2019 list this August, when we kick off another 25 years of the Oregon Business 100 Best Companies to Work For in Oregon. The March issue of Oregon Business will be on newsstands March 1st.